A memorial of flowers and posters made for murdered Muslim teen Nabra Hassanen in Washington was set on fire Wednesday morning. D.C. park police arrested 24-year-old Jonathan Solomon of North Carolina and charged him with vandalism. Park police have said it is unclear whether the items he set ablaze had been a part of the vigil held for Hassanen the day before or his own items. Flowers were lain and candles lit in the circle Tuesday night for Hassanen, a 17-year-old from Sterling, Virginia who was beaten to death with a baseball bat on her way to the mosque Sunday night. 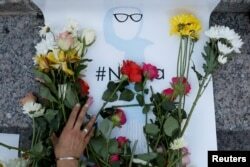 An attendee leaves flowers for Nabra Hassanen, a teenage Muslim girl killed by a bat-wielding motorist near a Virginia mosque, during a vigil in New York City, June 20, 2017. Tuesday night's vigil, which featured local speakers and Muslim activists, was followed by a prayer and iftar - a meal breaking the daily fast Muslim's observe during the month of Ramadan. Hassanen's killer, 22-year-old Darwin Martinez Torres, was arrested and charged with murder earlier this week. Hassanen’s killing sparked outrage and solidarity on social media, with many activists calling on police to investigate it as a hate crime. Family members say Hassanen and other girls in her group were wearing hijab, Muslim head scarves, when the attack occurred. But police and some witnesses said Torres appeared to be agitated by a traffic argument, not religious hatred.